There’s 24 hours in a day, which should be enough to get everything that you need to do, done. However, there’ll be multiple times a day when you think “When am I going to find the time to get this all done?” The key isn’t to find more time, it’s to make the most of the time you have. 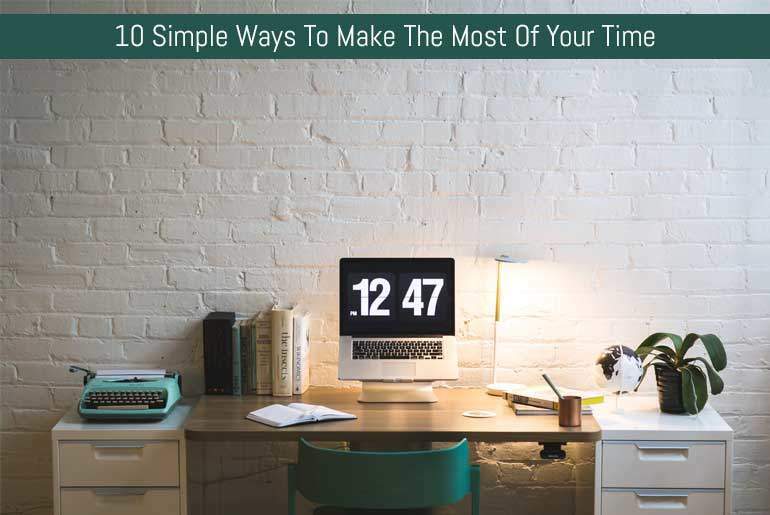 Here’s 10 ways you can make the most of your time and be more productive, every day. It’s easy to feel as though you have no time when you don’t have a solid plan. The day becomes a never ending pile of tasks, weighing you down. Instead, when you wake up, make a plan for everything you want to get done that day. You only need to spend around 10 minutes making this plan, but this will give your day structure. Every day, you’ll have tasks to do that will take precedence over everything else. Identify these tasks, and ensure you do them first. Mark Twain used to refer to this as ‘swallowing the frog’, as nothing else you’d do would be as unpleasant for the rest of the day. This is especially important if you live with a condition that limits your energy. Only plan for what you can physically handle during the day. If you try and take too much on, you can set yourself up to fail. This just makes you feel worse, and you won’t have a good handle on your task load. The Huffington Post: This site has lots of how tos and articles that can help you. UK Services Reviews: Reviews of services that can help you with your work. Forever Be Moved: This site has lots of tips on productivity. Revieweal: This writing tool can save you time. State Of Writing: Use this tool to boost your creativity. Top Canadian Writers: Use this writing tool when you need help with your tasks. AcademAdvisor: This vocabulary tool can help you find the right words at the right time. It makes sense that the earlier you get up, the more you can fit into your day. Try going to bed a little earlier every night, and train yourself to get up earlier every day. This can help you squeeze a lot more in. Multitasking sounds like a good idea, but in practice it can hinder you getting things done. Once you touch a task, follow it through to completion before you start working on something else. This will help work steadily through your to do list. Are you the kind of person who takes on everyone else’s work? It can stop you from getting your own work done, and exhaust you in the process. Practice saying “No” to people, if you don’t have to take their work on. You’ll be amazed at how much time you can free up. Many people take on too much because they’re worried about what others will think of them. Learn to let that go, and you’ll find that you’ll be much more productive. This is because you’ll focus on what you really need what to do, rather than what you think others think you should be doing. Do you specifically need to complete this task? If not, don’t be afraid to outsource. Give that job to someone else, and you’ll lighten your own load. Finally, before you make any decisions, slow down and think. Do you really need to do this? Is it going to help you accomplish your goals? If not, let it go. If you stop and think first, you can save yourself a lot of work. These ten tips are designed to help you get the most out of your day. Give them a try, and you’ll see how much you can accomplish. I totally agree with “one task at a time”. Nowadays, we do a lot of multitasking and people don’t realize that it is damaging the overall productivity. I also like the advice “say no”. It is pretty difficult but it is worth trying. In a matter of prioritizing I use a kanban board and it really helps to order tasks by priority and get them done.